Map 6 follows Map 2.In Map 6, three broad treatment approaches are considered for the treatment of anxiety issues. Roughly speaking, they can be called direct behavioral approaches, cognitive approaches, and psychodynamic therapies. The distinctions are addressed in Section 25. Each broad approach constitutes an entire family of therapies. Although the labels are succinct, there are many varieties of treatments within each family. Three other calming approaches are shown on the map but not yet elaborated on with text. There are also hybrid therapies, and many therapists work in their own unique styles. Take this representation not as definitive but suggestive. The map suggests an ordering to treatment approaches in working with anxiety issues – going from the most direct and immediate to more complex approaches as needed. If a patient can manage his/her anxiety effectively using relaxation techniques, is cognitive or psychodynamic therapy necessary? Maybe, maybe not. The question needs answering. The answer must come from the patient and therapist. Section 41 asks if the patient is satisfied with direct work. If so, the next step could be termination. The map also offers the possibility of by-passing direct symptom reduction and starting with cognitive-behavioral work [Section 29]. Here again, if the patient is satisfied, treatment may be finished. There are different paths to the use of psychodynamic therapy [Section 28], depending on the patient’s needs and the therapist’s judgment of possible effectiveness of various approaches. There can also be a mixing of techniques. 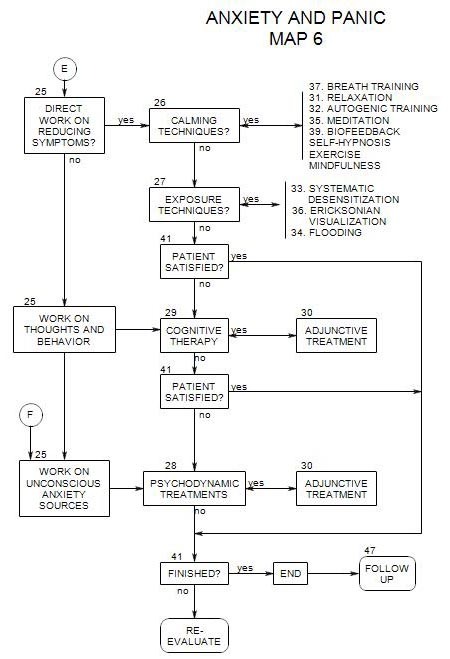 The map suggests that adjunctive techniques [Section 30] may be appropriate with either cognitive therapy [Section 29] or psychodynamic therapy [Section 28], but the details must always be left to you. How you might, for example, introduce systematic relaxation into psychoanalytic therapy of a particular patient is for you to determine. Even if the patient’s anxiety is relieved, however, there may be other issues that need addressing. There is no corresponding written section for re-evaluating the patient’s needs at this time; and the results of a re-evaluation could lead to a number of possible directions for treatment.